For me, a vacation is a time to go on an adventure. Whether that be for a weekend in a nearby park or a trip to a big city. I want to see, learn and do something when I am vacationing. I know others think of a vacation as a time to relax. Nothing wrong with that thinking, it is just not my way to vacation. I am a planner, too. On our vacation out west earlier this year, I had each day earmarked for something. Of course, once a day would start, it could deviate from the chosen activity and even location depending on our mood, weather, location, special circumstances, etc. The plan is never rigid. While the trip did include National Parks and Disneyland, we spent a couple of days in Las Vegas, Nevada. The first evening there I went out and did night photography. I mean, it is a must when in Vegas for a photographer, right? Paris Las Vegas Hotel and Casino late at night in Las Vegas, Nevada. Nikon D700/28-300VR, 1/60s, f/5.3, ISO 6400, EV 0, 112mm focal length. We had not visited Las Vegas since the early 1990’s. What a change. 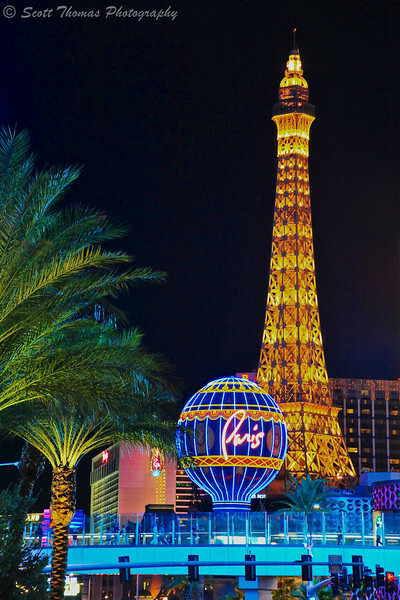 In the Paris Casino photo above, you can see one of them: an elevated walkway over the busy streets of Las Vegas. Down the boulevard from there, we watched a few showings at the Fountains of Bellagio. My tripod was a huge help here. Fountains of Bellagio show in front of the Bellagio Casino in Las Vegas, Nevada. Nikon D700/Tokina 11-16mm, 1.3s, f/16, ISO 400, EV 0, 16mm focal length, tripod. The fountain shows are free with a new one being presented every fifteen minutes. As much as I tried, it was hard to show the size of the Hoover Dam. Here is one attempt taken from the Visitor Center parking garage. 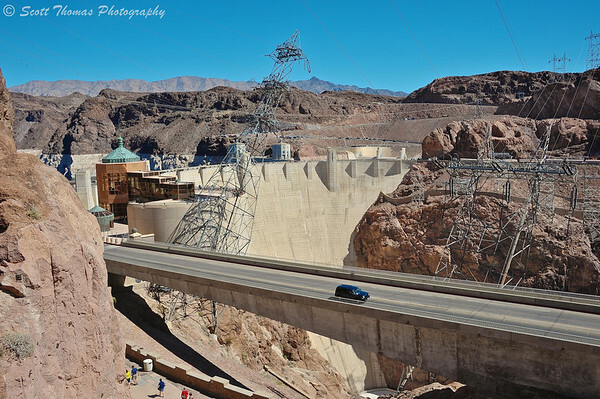 The Hoover Dam complex photographed from the Visitor Parking Garage near Boulder City, Nevada. Nikon D700/28-300VR, 1/160s, f/16, ISO 200, EV -0.3, 28mm focal length. For some prospective, the Gateway Arch in St. Louis I have photographed is 630 feet (192 meters) high. You know I had to take a photo looking right down the middle of the Hoover Dam at the Colorado River 726 feet below, right? Looking down the 726 foot high Hoover Dam on the Colorado River down the Black Canyon. It took 3.25 million cubic yards of concrete to build the dam, first called Boulder Dam, back in 1935. Nikon D700/Tokina 11-16mm, 1/125s, f/16, ISO 220, EV 0, 15mm focal length. Behind the Hoover Dam is Lake Mead, the largest reservoir in the United States by volume according to Wikipedia. Four large Penstock Tower Inlets feed the water into the huge turbines inside the dam to produce an average of 4.2 terawatt hours of electricity annually. The power is distributed to the states of Nevada, Arizona and California. 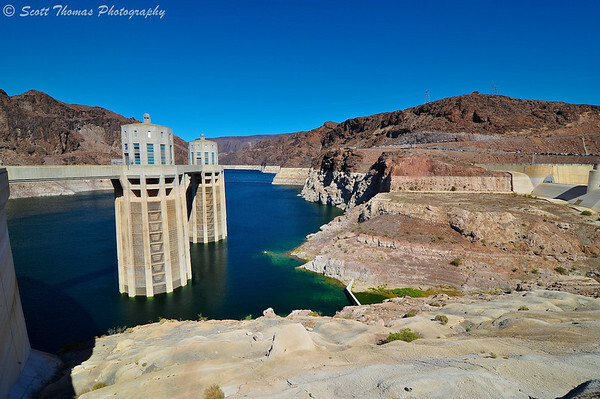 Two of the four Hoover Dam penstock tower inlets on the Arizona side in Lake Mead. Nikon D700/Tokina 11-16mm, 1/160s, f/16, ISO 200, EV -0.3, 16mm focal length. Hope you enjoyed learning from my adventure! This is my contribution to my blog’s assignment on Vacation (click the link to see more vacation photography). 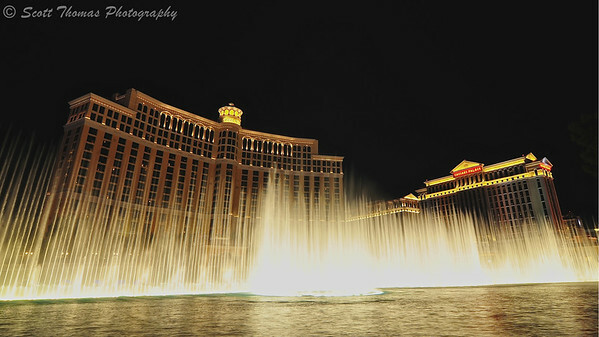 This entry was posted in Travel and tagged 28-300mm, adventure, bellagio, boulder city, eiffel tower, energy, fountians, hoover dam, inlets, lake mead, las vegas, lights, long exposure, nevada, night photography, nikon D700, paris casino, penstock towers, power, show, tripod, vacation, vr, water. Bookmark the permalink. Beautiful work while on vacation, Scott. What a trip! I think vacations can go both ways – some meant for relaxing, some meant for adventuring. I hope to be able to take more of both kinds in the future. You’ve got some really cool shots here. I bet you had 1000’s of photos to sort through when you got home! Wow! Looks like a wonderful trip, Scott. 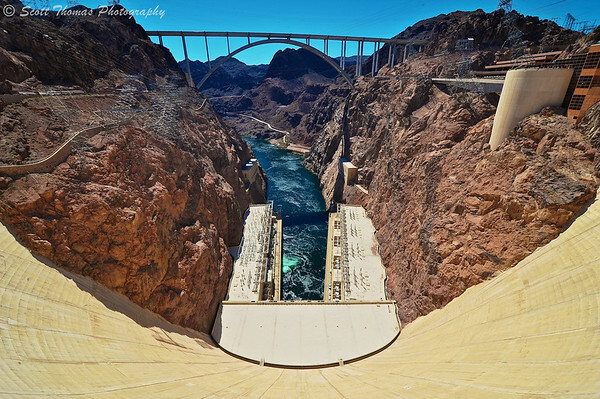 The shot looking down the Hoover Dam at the river makes me dizzy. lol!